Each year MJSA – the U.S. trade association dedicated to professional excellence in jewelry making and design – announces winners from its Vision Awards Competition. Created to recognize outstanding achievements in design and manufacturing, awards are segmented into categories most representative of the modern jeweler. 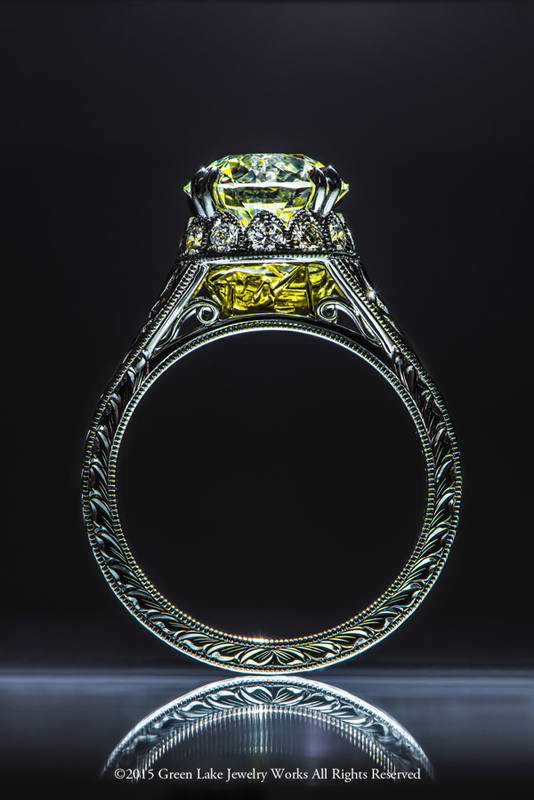 One of those areas of distinction is ‘Custom Design’ and this year 20-year veteran of custom jewelry and founding member of Green Lake, Krista Robertson, received the award for designing a truly amazing ring. 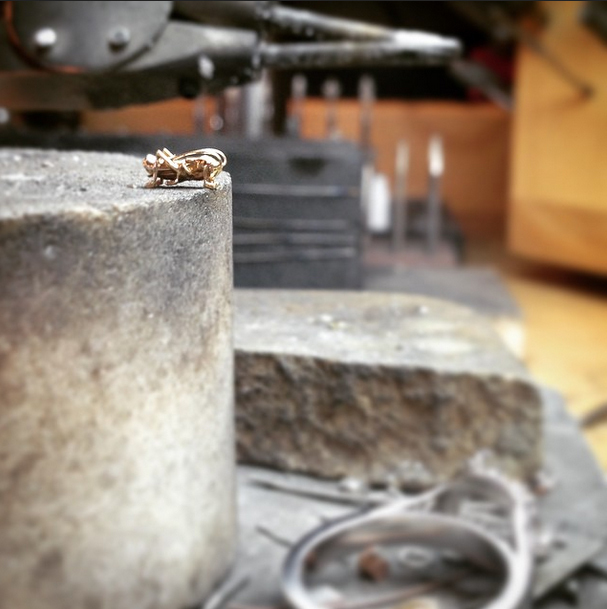 The Grasshopper Ring – That’s what we’re calling it at least. But this expertly engraved platinum and 18K gold ring with a 2.76ct round-cut diamond center (and yes, a cute little grasshopper hiding out in the gallery) is so much more than the sum of its parts. This ring is the result of a client’s ambition to repurpose her family heirloom and retell a story of its history in ways only the she could know. One simply can’t buy a ring like this out of a case, or configure it together from a catalogue of parts; it has to be custom made. 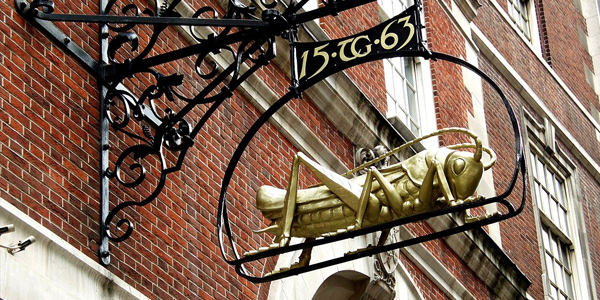 “Londres – Lombard Street” by Josep Renalias depicting Gresham’s initials and his golden grasshopper emblem. Perhaps the most challenging aspect of this design was the inclusion of a golden grasshopper, a family crest and icon of the Royal Exchange of London for which the client’s ancestor Sir Thomas Gresham founded. Outside of butterflies however, including insects in wedding jewelry whilst maintaining an elegant presentation can be tricky business. Krista worked with her client to play on the placement of grasshoppers – from an engraved pattern to cast elements down the sides – before deciding on a discreet little spot under the gallery, veiled by the center diamond and visible only once raised up on the finger so the wearer could show it off as she saw fit. The scale for wedding jewelry is especially tiny, so hiding a miniscule grasshopper and having it still clearly look like one is no easy feat either. Krista teamed up with award-winning CAD Modeler Kelsey to create a realistic-looking grasshopper, which they grew in resin on the workshop’s 3D printer, precise layer by layer. Green Lake’s caster Bruce (who, unlike most casters in the industry, is regularly handed completely new, never-been-done-before shapes of dizzying complexity) diligently set to casting a remarkably crisp finished product in gold. With all the custom parts in place, Gold and Platinumsith extraordinaire Sungwoo (Eric) Hong set to the finishing touches, making this a collaborative effort to meet the client’s greatest expectations, Krista’s distinct vision and of course the shop’s exacting standards. 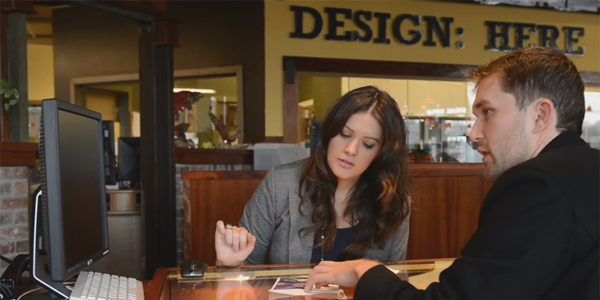 Green Lake Designer Krista Robertson collaborating on a custom engagement ring for Ryan & Jess.